« Play Like A ……. Jet??? Is Ravens' Kicking "Competition" a Farce? As the Baltimore Ravens continue their ongoing quest to replace the legendary-around-these-parts Matt Stover at placekicker, an interesting dynamic has evolved in this year’s fight for the position. 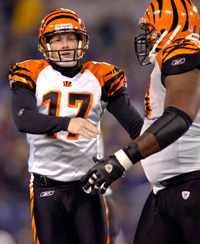 Eleventh-year veteran Shayne Graham was signed this spring, and was expected to win the position from seventh-year player Billy Cundiff, who kicked for the Ravens for the final 7 games of the 2009 campaign. Graham enters 2010 as the 4th most accurate kicker in NFL history at 85.2% (since I know you’ll ask, Stover currently sits at 83.7%). He has a reputation for failing in the clutch though, and never was this more evident than during the 2009 playoffs, when he missed two FGs during a 24-14 loss to the New York Jets. Cundiff was a mediocre 12-for-17 for the Ravens in 2009, including misses from 37 and 51 in the season finale against Oakland, a game the team needed to win to make the postseason, and a miss from 30 in week 11 against the Colts, a game the Ravens lost 17-15. So, again, Graham seemed to be the obvious of the two less-than-stellar choices for the Ravens going into the 2010 season. Fox 1370’s Rob Long stated last week, prior to the Carolina game, that Billy Cundiff had far outshone Shayne Graham in camp to that point. He went so far as to say that, should Graham miss a field goal in the first preseason game, then Cundiff would have effectively “lapped” him in the kicking competition. Graham, of course, DID miss on Thursday night, wide right from 50 yards. Cundiff kicked only extra points. Both kickers were impressive on kickoffs, notching touchbacks. If Long is correct then, and Thursday only served to widen the gap between the two kickers, then statements made earlier this week by Glenn Clark of WNST are more than a little confusing. Billy Cundiff is MUCH closer in the kicking competition than he might appear; but the team has made it clear that Shayne Graham will be their guy. I think with Katula gone it will be interesting to see how the competition goes. It’s all on Graham to make kicks moving forward as the team has decided that Katula was part of the problem. Multiple folks in the organization have privately handed Graham the job, but they’re maintaining publicly that they’re still competing. Privately, the job is Graham’s. Publicly, there’s a competition. With Katula now gone, there will be no excuses if Graham misses more kicks. But the organization has been privately working under the assumption that Graham will be the kicker. Interesting, and more than a tad confusing. It sounds as though, from Glenn’s perspective, that there really is no kicking “competition,” per se, as the Ravens have already privately handed Graham the job. I’d be disappointed if the truth really is that this “competition” was decided before training camp even started, and that Cundiff was kept around only to keep the pressure on Graham. In the end though, it could be a moot point. If Graham finishes out the preseason perfect on his kicks, then I have no problem with the team taking him to Meadowlands Stadium on September 13. Hopefully this is the case. If Graham continues to miss kicks, while Cundiff at least matches him in practices and preseason games, and yet Graham STILL suits up in purple to start the 2010, Ravens fans could be left not only scratching their heads, but once again pining for the return of #3. Ugh. Once again, way too much “ink” being used in Baltimore with regards to freakin’ kickers. This entry was posted on August 18, 2010 at 10:46 am and is filed under Ravens, Training Camp. You can follow any responses to this entry through the RSS 2.0 feed. You can skip to the end and leave a response. Pinging is currently not allowed.